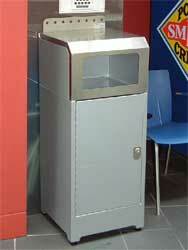 This free standing refuse station is of all steel construction with a brushed stainless top. It is compact with front opening door accessing a heavy duty 80 litre plastic liner. The door is secured with a child proof lock or magnet push latch. 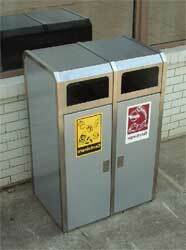 The top can have an apron added as a food tray collection point, or be custom fitted with an ashtray or planter box. Adjustable feet for uneven surfaces come as standard. Designed to encourage recycling in the food court, these stations have a prestige finish of external polished stainless steel frame and hood with powder coated panels, or timber veneer infills to help match your existing décor. The stainless hood can be customized with oblong or round access openings on one side, side or two alternate sides for refuse and recyclables. The hood top can be customised to house an ashtray or planter box. The metal liners nest above an internal drip tray and are of 140 litres capacity each. The slim design enables easy retro fitting to your food consumption area and the six adjustable feet accommodate uneven floors. Available with lockable doors or magnetic catches.